Cheap area rugs at Superior Rugs. 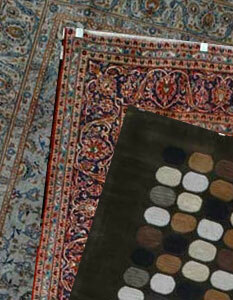 We feature area rugs in Persian and Oriental, affordable area rugs at discounted prices! The rectangular area rugs in Superior Rugs are beautifully designed and are sure to become valued treasures in your home. Regardless of your budget, size requirement, or colors you are looking for we have area rugs that would be perfect for you. Superior Rugs is a division of Superior Importers Co, one of the largest manufacturers of Oriental Rugs and Persian area rugs. 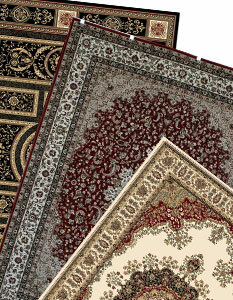 Superior rugs has been a leading supplier of area rugs and distributes our rugs around the world. When you order an area rug from Superior Rugs you are buying area rugs right off the factory floor. Here area some of the most popular discount area rugs out there today. 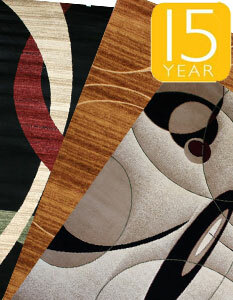 We have been manufacturing high quality area rugs for over 20 years and stand behind every area rug we sell. Most online web sites only back their rugs for 15 days, however Superior Rugs backs all our area rugs for a full 30 days plus an additional 60 days for manufacturer defects. 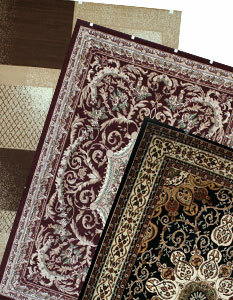 We also carry lines exclusive to Superior Rugs only. You will not be able to find a better deal with our line of rugs. But Why Should I Buy from Superior Rugs? 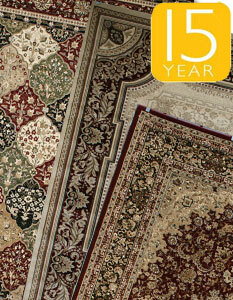 Unlike most online rug retailers they are middlemen trying to give you the best price. In this case we manufacturer our line and sell directly without the middleman and give you the best possible price for your dollar. Please stop by our factory direct warehouse if you live in Central New Jersey; we would love to show you our great selection. This rug is 100% Pure wool made of the finest softest most durable wool. These rugs have a pile of 1 INCH THICK and are perfect for any room with carpet or hardwood floors. The colors are vibrant and will not run. This will stay with you for many years to come. This rug has a knotted fringe. If you are not sure what you are looking for give us a call anytime or view our guide on how to buy an Oriental Rug. A rug needs to harmonize with a room's decor to bring everything together. Color is the most powerful decorative element in creating the ambience of a room. Therefore, the color scheme used when choosing a rug is extremely important. Unless you are completely redecorating an entire room, you will want to choose discount area rugs that will compliment existing furniture, wall colors, furniture, and window coverings. Keep in mind that the color of your current floor should be considered since it will be closest to the selected area rug. An easy technique to use when choosing a new rug, is to pick the color already used on a wall, or contained in a furnishing pattern. If you have any questions about the color of our area rugs feel free to give us a call. Measure your space that you plan to put your rug. Keep in mind that we have many different shapes; rectangular, oval, round, and runners are just to name a few. Remember the easiest way to liven up a room or hide that dingy carpet is with a beautiful area rug (yes we do have very good discount area rugs). That's why we have a trained staff waiting to help you through every choice you need to make. While browsing Superior Rugs, hidden treasures are abundant as you view centuries old area rugs designs from South Asia. These masterpieces have been crafted using today's high quality materials and techniques. Most rugs found on Superior Rugs are heat-set polypropylene or wool rugs, and are yarn-dyed providing long lasting colors. Our finely woven area rugs are like pictures for the floor. Our rugs contain crisp lines and deep colors that will bring out accent colors in any room. We have added many cheap area rugs to our website for you to view. Go to our clearance area.